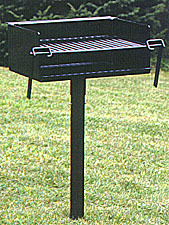 Stationary campfire park grill models 160 and 140 are equipped with a 2 1/2" 11 gauge steel post 42" in length for setting in concrete. Portable grill models have a 24" pedestal welded to a 16" x 16" x 3/16" gauge base plate. Both models have a locking device to prevent theft, and swivel 360. Finished in non toxic rust resistant black enamel. Our campfire park grill model 160 provides 280 square inches of cooking surface. Grill bars are 1/2" round on 1 1/8" centers. The top adjusts to four levels for excellent heat control, and tilts back for easy fire building or ash removal. Grill cannot be removed from fire box. Handles swing down when in use to stay cool. The fire box is fabricated of 3/16" gauge steel, and measures 20" wide x 14" deep and 8 1/4" high. Smaller in size, as well as in price, the 140 campfire park grill is made from the same heavy material as the 160. 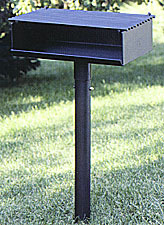 The fire box is 3/16" gauge steel and measures 18" wide 12" deep and 5" high. The grill bars are 1/2" rounds on 1 1/8" centers. The cooking surface is 224 square inches and measures 11 1/2" x 19 1/2". The grill flips back for easy fire building and ash removal, and cannot be removed from the fire box. For longevity and highest quality materials, you just can't beat the campfire park grill and campfire ring made by Chadwick Manufacturing.